The first time I fished San Diego Bay was in the very early 1950’s. From our home at 26th and C Street, my father drove down Broadway and found a parking space next to Lane Field, home of the Pacific Coast League Padres. After unloading a couple fishing outfits along with a tackle box we crossed Harbor Drive to the foot of Broadway and picked a spot later selected for the pier now used by Hornblower Cruises. I don’t remember what we used for bait, but I do recall that we caught a few fish and that my most lasting memory is of how much trash was in the water. My most recent trip came February 16, and the reasons are many as to why our harbor is this region’s best fishing hole: it’s free and available to anglers every day, full of a variety of fish, readily accessible by boat or from shore and is considerably cleaner than it was in my youth. From that first trip to the last spans a period approaching 70 years and suffice to say there were many trips and observations in between. By the time I was eight or nine years old I was allowed a free hand to roam what has since been called a “sleepy little Navy town” during that timeframe in the city’s history. Some of that roaming involved walking to the corner of 26th and B Street with a fishing outfit and bucket and waiting for the bus that bore the destination sign 2 Piers. There were times when I rode it with Mae Williams who it seems always and proudly wore a uniform indicating her position as the local Commander of the Salvation Army, which I’m told was embarrassing to her son Ted who I understand turned out to be a pretty decent baseball player. Bryce Miller’s first halibut – a bucket list species for him, he’d catch two more later. A few blocks after she left the bus for Salvation Army Headquarters, it would reach my destination which was the foot of Broadway Pier, and opened a door to a variety of fishing adventures. Some days I‘d walk north along the Embarcadero to Grape Street where mostly Italian and Sicilian commercial fishermen mended their nets and readied their fleet of boats. Other times I’d walk south to fish near the Ferry Landing and if I felt particularly adventurous I’d take the Nickel Snatcher across the channel to fish from the North Island Naval Base which was one of the benefits possessing an ID card showing I was the dependent son of a retired Chief Warrant Officer. I don’t recall catching many fish or any that were particularly large or noteworthy, but that was beside the point and immaterial to a kid who simply wanted to be and had to be fishing. A few years later I fished the bay for the first time in a boat after my father picked up a 13 foot Glaspar skiff which was about the same time we were on the forefront locally of bass fishing with plastic worms which we bought in bulk by the gross from Herter’s of Waseca, Minnesota. At least six dozen would be black, another three dozen would be purple followed by a dozen that bore the color of a night crawler and that would take care of our bass fishing. We experimented with two color patterns I’ve not seen since, Catalpa worm yellow and Catalpa worm white, each of which had large black spots over their base colors. Author, Jim Brown with a spotty to match Miller’s small aquarium quality halibut. The Catalpa worm patterns worked no better and often not as well as the other colors for bass in local lakes, but they were nothing short of spectacular in the bay, particularly if my father chose to carefully split their tails to provide a little more action. We rigged them the same as we did for the lakes with half of an egg sinker that had been cut in two with a hacksaw and a 1/0 or 2/0 hook. Another benefit of using plastic worms was that they were a lot cheaper and less painful to lose than the Wright McGill Flasher, a large gold spoon that was as deadly effective for bass in the bay as it was for corvina in the Salton Sea. While we fished a number of areas after leaving the Shelter Island Launch Ramp, there was little need to go farther than a few hundred yards if the target was sandbass, because an eel grass bed just north of the pier was loaded! The most striking difference to me between the past and present is the recollection that our catch in those days was dominated by large two to five pound barred sandbass rather than the small one to two pound spotted sandbass that are predominant today. How good was the fishing? Good enough that a couple Point Loma High School students who regularly ditched school had a pretty good income from all the barred sandbass they caught and sold for 35 cents a pound to the Woo Chee Chong fish market. 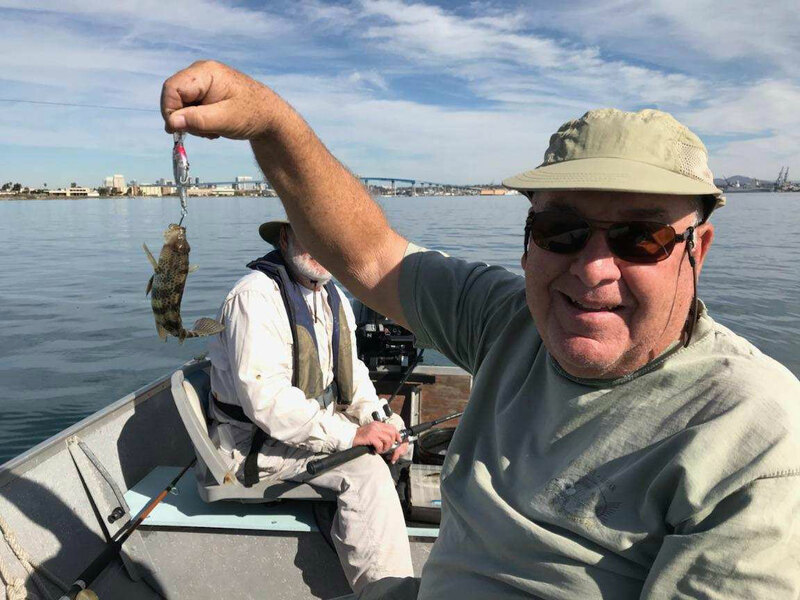 Somehow, that thumbnail look at the past brings us to today, or at least a few days ago when I arranged for my newest fishing partner to join me and my oldest fishing partner aboard the latter’s boat for an introduction to a few of the fish of San Diego Bay. Bryce Miller is a native Iowan and avid fisherman who migrated here to serve as a sports columnist for the San Diego Union-Tribune. Norm Pierce is a fishing and hunting partner of longstanding. Like me he is a native who believes that despite the otherwise oppressive population boom and largely ill-conceived development – we as anglers we have a lot to be thankful for if we just do a little exploration. The primary purpose of this particular morning on the bay was to provide Bryce with a shortcut to that discovery. 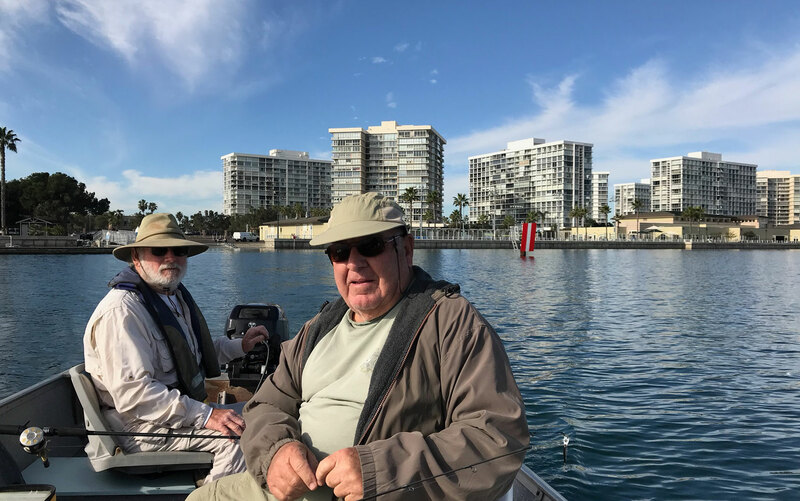 Not long after leaving Coronado’s Glorietta Bay Launch Ramp, skipper Norm decided we’d do a little trolling, a method largely pioneered locally and promoted by Neil Kelly who years earlier and along with my father had been a member of the now defunct Federal Employees Rod and Reel Club. 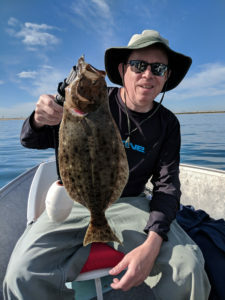 Neil discovered that simply by trolling the right lure, even a person who could not cast could catch plenty of fish in the bays and estuaries from southern California all the way down both sides of the peninsula of Baja California. The right lure for Neil was the blue and silver Rebel, a lure that came with deep diving and shallow running models as well as straight body and jointed. Neil wrote a book on the subject and taught classes through extension courses at Mesa College, all the while preaching the virtues of his style of fishing with the passion of a television evangelist. 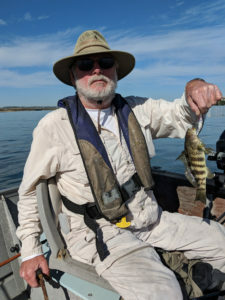 Norm Pierce with one of many small spotted bay bass on the day. Norm’s method varies only in his choice of lures, baitfish colored crank baits for the most part. On most days they are deadly effective, providing him with catches of a multitude of species that includes but is not limited to: spotted and barred sandbass, calico (kelp) bass, halibut, flounder, bonito, mackerel, jack smelt, barracuda, yellowfin croaker, queenfish, sargo, bonefish and…need I say more? Norm has refined the method and simply catches fish, lots of them. Depending upon his partners he may stick with trolling or use it as a searching method to find concentrations of fish. With the intent of showing Bryce a little drift fishing with plastic swimbaits we spent part of the morning working across eel grass beds favored by the sandbass and halibut. Our fishing results that morning were fair, but not great. What was great from my perspective was being in the boat with a partner of longstanding, sharing the bay with a relatively new partner who knocked a couple species off his bucket list, and enjoying the realization that we could rag on each other unmercifully and without rancor – but with plenty of laughter. Good partners are like that, and when the destination is San Diego Bay the fishing is good more often than not.